What’s the deal with the new PMXE 0254f? I can no longer do this and that in it! What is new in PMXE 0254f… the new PMXE in English? 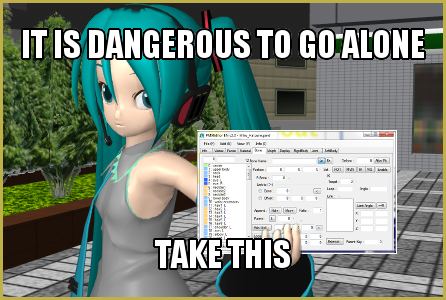 Up until recently, we’ve been recommending the 0222 version of PMX Editor to our readers for editing their MMD models. Even though more advanced versions had been released since then, this one had much more comprehensible English translation (made by EosCustom3D), and therefore was more preferable, especially for beginners. Well, no longer. From now on, our Downloads page PMXE link leads to the newer English translation, courtesy of Inochi-PM. This is a 0254f version, currently matching the latest Japanese release on the PMXE homepage. Remember to UNBLOCK the ZIP before you extract all. This is the latest version of PMXE in English… but still, upgrading to the newer PMXE has its difficulties. Along with newer features (that one can simply put aside, until he really needs them), there are features that model-makers got used to, and that work differently now, causing confusion. First, there’s morph editing. Previously, it was performed in a two-panel Morph Edit window, with left half being the field of operation, and the right one displaying changes dynamically. Now, the newly summoned SubView window only has one panel that receives no edits no matter what you do to it. Don’t worry, it’s still simple. All changes are performed in the *main* PMXView window (that is updated with the 100% state of the morph you chose to edit while the Editing mode is on), and the SubView demonstrates changes like the former right pane. You can simply place it on the right side of PMXView, giving it semblance to the familiar two-pane look. Second feature that was changed is Batch Renaming. Compared to the old Name Repair panel, the newer one is much more powerful and easy to use once you get accustomed to it. Choose the group of names you want to edit in the dropdown list to the left. “JP Name” and “EN Name” columns display the current state of all names, while you enter changes into the “EN Replacement” column (or “JP Replacement”, if there’s such need). Once you’re ready, hit “GO” button. 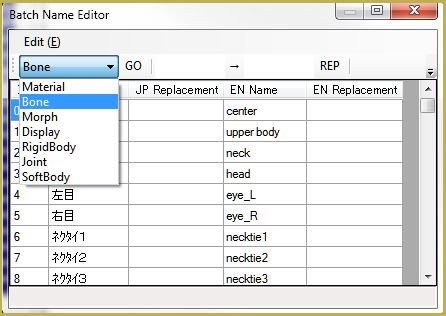 You can also use the “Edit->Japanese Name – English Name” menu command to rename most of standard-named Japanese bones into English with a single click (you may still need other means for translating bones with non-conventional names, though). 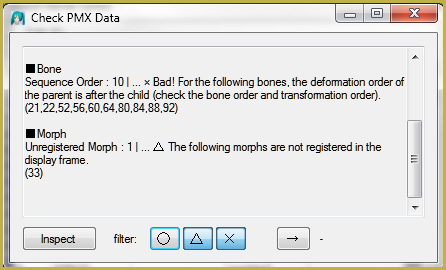 Bonus feature is “File->PMX Info” command, inspecting the model for possible errors. While present in the previously promoted version, it had its output in Japanese, thus making its usefulness not quite obvious. Now that it’s fully translated, we urgently recommend it to every MMDer who wants to make their own models. … please share your discoveries! If you notice some other features that act differently from the previous version to the point of being incomprehensible, report them in comments. The page will be updated accordingly. Hiratabashi Station Stage by AkitaFanZ.